Thank you Tracey and Andy for another warm welcome to No 31 Belper. This was our third visit to this lovely bungalow and it did not disappoint from the lovely flowers, chocolates, wine, coffee and the most important milk to start the brews. From the start we all felt at home with this well equipped bungalow that covers all our needs. Belper is a lovely town to explore with plenty of shops and eateries. Cafe G is a must for the cooked Breakfast with very friendly management and low prices and the Sunday Roast served up at the Hanging Gate ten minutes away on the Ashbourne road was first class. This bungalow is in a ideal location for exploring the surrounding countryside and if your into gardens Cascades Gardens at Bonsall is well worth a visit. We enjoy coming to this bungalow which is so well maintained by Tracey and Andy. Plus the local area has so much to offer that we are already planning a fourth visit for next year. We had a lovely time over Christmas & New Year; it was very quiet and relaxing. The generous welcome basket and flowers were much appreciated. The bungalow was nicely decorated for Christmas and everything was spotlessly clean. Loads of information provided on local attractions and places to visit. Would highly recommend staying here. We have just spent another week here our second stay just before Christmas at No 31. This bungalow is wonderfully cosy, beautifully decorated and furnished, plenty of hot water, comfy bed and warm duvet, very well equipped with everything you need and more. The more being a wonderful welcome basket brimming with goodies, a gorgeous decorated Christmas tree and house decorations. There’s plenty to do in Derbyshire in the winter and it must be a popular season, as it was still very busy, plenty of walks, seeing Chatsworth House decorated for Christmas was a highlight, lazy lunches in the pub and then back to No 31, Tracey has made our pre Christmas break very special. Thank you. We love visiting this area and will stay again, so much so, we’ve already booked for next year. My wife and I sayed here with one of our French friends. Although we are both from this area originally it was a pleasure to return and share the hidden benefits of Belper with our friend. The house was perfect and We would have no hesitation in advising people to stay here. It is so comfortable, supplied with everything we needed. Just right for visiting relation in Belper and ideal for visiting Peak district, Chatsworth, Denby pottery Derby, Masson Mills always worth a visit. The Joiners Arms in Quarndon superb food , but need to book. The best property in the Peak District that we have stayed in. Everything about this property was perfect. Everything that you could possibly need (and more) was provided. The beds were so comfortable and the cleanliness was second to none. After visiting Derbyshire annually for the last 23 years, we have finally found a property that we will return to. Thank you so much Tracey. From the moment we walked in we knew we had picked well. The bungalow was so well equipped but also very comfortable to stay in. The beds were a welcome sleep haven after our long walks and days out. The flowers and extra goodies were a very thoughtful touch from Tracey as well as all the information/guides available to read through. It is not just a base for a holiday, it does feel like your home and it was lovely to know you were going back there after a days adventure in the Peak District! Excellent, such attention to detail. Set on the edge of the Peak District the location is wonderful. The bungalow was perfect for our stay and had everything you could wish for. I can’t praise it enough. I would recommend to anyone. The bungalow had everything you would need and Tracey had thought of so much more. Not only the lovely welcome items, such as flowers, wine, chocolates, fresh coffee and milk to name but a few but the use of rucksacks and flasks should you need them and handy items in the kitchen such as cling film and foil. The bungalow is very clean and tidy making it a relaxing and comfortable break in a very peaceful area and very accessible to the vast array of places to visit nearby. We stayed for a week and the only problem was that it didn’t seem long enough! Tracey is there to greet you upon arrival and take you through everything you need to know. The bungalow itself is great, there were 4 of us and we had plenty of room. It is well equipped with everything you need for your stay. Location wise it was great as all the place we wanted to visit were within 30 mins drive. Garden was peaceful and great place to relax after a busy day. Flowers and chocolates on arrival and a bottle of cooling in the fridge for us……bliss!! This is our third visit to No 31 Belper and we love it. We could not wish for a better base for exploring delightful Derbyshire The property is always immaculate and the owner thinks of everything to make your stay a comfortable and happy one. Comfortable lounge , comfortable beds, well equipped kitchen and a secluded garden to relax in. This is the ideal home from home holiday let. Tracey was there to meet us and showed us around. There were fresh flowers and yummy chocolates along with chocolate buttons for the children. We had milk in the fridge for tea, a packet of coffee and wine for later. The beds had been made up with duvets but the weather was very hot so Tracey left extra top sheets and we just slept under them. It was very thoughtful. The place was spotlessly clean with plenty of towels. It may not be an ultra modern property but it was comfortable and we felt very relaxed. Also provided are a mountain of leaflets for local attractions and we were well placed to visit many of them. We could have spent another week exploring as there are so many things to do. We would certainly recommend to others. We’ve had a lovely break. The property was lovely and was easily the best equipped out of any holiday home we have stayed in, with lots of thoughtful extras. Tracey (the owner) was really helpful and gave us lots of suggestions of things to do in the area with our young son. Immaculate, well equiped ‘home from home’. Have just returned from a wonderful week in Belper, This bungalow was immaculately clean throughout, fitted out with everything you could possibly want for a weeks holiday. Was met on arrival by owner who also left a welcome pack of teas, coffees and milk as well as wine, chocolates and flowers. Outside there is a wonderful garden in which to sit and relax at the end of the day. Hope to return very soon. Excellent bungalow and facilities, Tracey was an excellent host, nothing was too much trouble and all the additional “goodies” made the stay very enjoyable – thank you for the care and attention. Area is a brilliant area to visit, so much to see and do, not enough days to do it all in. This was our second stay in this comfortable, clean, well equipped bungalow. Although it was cold outside we were cozy and warm inside and our daughter loves the bed and duvet. Tracey makes you feel very welcome and is always available if needed. Belper is a lovely town with plenty of shops and places to eat and is ideally situated for exploring the Peak District and local area. We received a warm welcome from our host Tracey, she had left us milk a bottle of wine also flowers and 3 lovely Easter eggs , such a nice touch. The bungalow was spotless and well maintained and is very well equipped all you need is to buy food for your stay. There is plenty of tourist literature available to help you make the most of your stay. After a long day exploring the area it was nice to return home to relax at No 31 in its tranquil location. I don’t think you will find a more quiet relaxing property in the Dales. Hope we may be able to return in the future. Delightful, relaxing, everything you could want or need. We had a perfect, relaxing stay in this wonderful house in Derbyshire. Tracey was a fantastic host, and ensured that we had everything we needed. Attention to detail really made the cottage stand out, right down to the beautiful flowers, welcome basket with Chocolates, jam and proper coffee plus she left us milk and a lovely bottle of wine in the fridge. It was cozy and warm with very comfortable beds and a great living space. Overall, we were very impressed and couldn’t fault our stay. No 31 was perfect, would definitely return! A comfortable well equipped bungalow. The property is in a quiet area just out of town, it is walkable if you have good mobility & don’t mind the hills. The bungalow is very well equipped & we were welcomed by Tracey & given all the information of the area we could wish for. A good find. A lovely clean, comfortable well equipped bungalow, warm, good beds & a private garden, a good find. We had a lovely stay at the bungalow,Tracey was welcoming & there was all the information for Belper & surrounding area we could wish for. The town centre is pleasant with the usual shops but also an assortment of specialist shops.The luxury treats were enjoyed,for once it lived up to my expectations, we’ll be back. We spent just a week at No 31 (wish it could have been longer!) and were SO happy. The property isn’t your traditional stone cottage but hey who cares, it was far far better than most of the cottages we have stayed in previously, one being able to park on the drive, knowing we didn’t have to do battle at the end of our day out and being stressed at having to find a suitable parking space like some cottages we have stayed in previously, this to us is one of the many things that made our holiday. it was perfect and could not be more ‘home-from-home’. Guest service from Tracey, the owner of No 31, was fantastic. She was very efficient and thorough with all communication via email, she even sent us a location map, and text and was very pleased to offer assistance if required. On the day of arrival we were warmly greeted and given a guided tour. We were delighted to be given a “Welcome” basket of goodies including beautiful flowers, Chocolates, Jam and a bottle of wine chilling in the fridge and more. There was even 4 pints milk in the fridge so we could make a hot drink (with the tea and coffee provided) and settle in before needing to go out shopping. She was very obliging and happy to help. My wife and I absolutely loved the property, a little gem of a find, It has been tastefully furnished and were delighted to find that it looks even nicer and is more spacious when inside than it looks in the photos. The lounge is bright and airy. Tracey really has thought of everything that guests may need, there has been so much thought put in to equipping the cottage and attention to detail everything you need and more. The garden is also a wonderful space and very private for us to sit out in (table and chairs provided) and take in the peace and quiet. There are lovely walks at the back, the views are superb. It is very tranquil. In terms of self-catering, because the kitchen is so well equipped you could really choose a variety of things to cook and you’d highly likely find all the utensils etc you needed to cook/prepare it. Plus my wife loved the Denby. We were very lucky with the weather but should you need to/choose to stay in there is lots to do. A selection of magazines/ bookcase of books/games for various ages/ a tv, dvd and video player (bring your own DVD’s). Having wifi was also a big bonus, great connection. As you can tell from our review we really enjoyed our stay at No 31. Thank you so much Tracey for our wonderful stay. Lovely bungalow, very comfortable, fantastic welcome. This is a nice 2 bedroom bungalow on the outskirts of Belper. The bungalow is very well equipped with lots of little extras which make the holiday special. There is a fantastic amount of tourist literature to help you make the most of your stay. The welcome card, flowers and chocolates were nice touches. Tracey was a wonderful host . We were a family with a 16month old and Tracey had a cot and highchair and many toys for her to enjoy! There is a park around the corner and the neighbourhood is quiet. We felt very welcome and settled in easily. We were welcomed with flowers, chocolate, and even milk to make a cuppa! The beds were comfy and much appreciated. There is nothing negative to say, only good things. We hope to return again ! Wow!! From Start to Finish this has been brilliant. Tracy and Andy are fantastic owners.The property was spotless and well maintained. Extremely quite area,which was brilliant. Lovely local walks within Belper,Matlock and Bakewell. Fantastic sites and many photographic opportunities.. A stunning area.. Recommend … We will return..
A beautiful bungalow in Belper with a secluded back garden. It is equipped with everything you need for a fabulous stay. Tracey met us and made us feel so welcome. She gave us a tour around the bungalow and explained everything that we needed to know. There were lovely touches like a welcome card, a vase of fresh flowers, sweets, chocolate, a bottle of wine and milk in the fridge. The bungalow was spotlessly clean and very well presented. The beds were very comfortable. We enjoyed visiting Hardwick Hall, Bakewell, Calke Abbey, Denby Factory and the Outlet Village at Junction 28. We could recommend this bungalow to anyone and we definitely hope to return again in the future. A beautiful, comfortable, clean, and fully equipped bungalow in a peaceful location. Ideally situated in the town of Belper with all essentials close by, including rail and bus links. Highly recommend Cafe G for a breakfast and The Lion Hotel for meals. Thank you Tracey for the warm welcome and lovely gifts. Tracey also helped to make our daughter’s graduation extra special. We definitely plan on returning in the foreseeable future! Very nicely situated for exploring the Derbyshire dales and the surprising historic town of Belper amazing place ! We really enjoyed our stay in this well equipped and spotlessly clean bungalow. It had everything you needed for a restful holiday and the chocolates, wine, flowers and milk were a nice touch. Tracey greeted us and she was always contactable if we had any queries. The town of Belper is interesting and the North Mill and Riverside Gardens are well worth a visit.. There are plenty of other places to visit less than an hour’s drive away. 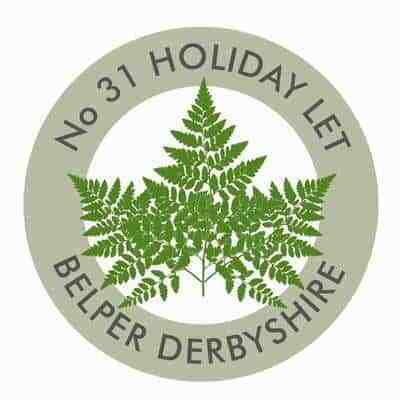 Would recommend 31 Belper for a restful break. We have recently had a second wonderful stay in this most fantastic holiday let. From the moment you are met by the owner you know you have chosen a great place to stay. The welcome is beyond compare, very friendly and informative. Nothing is too much trouble. All you need is your food and your clothes. Everything else you need is provided, in this very well equipped accommodation. If you are thinking of booking, don’t hesitate, you wont be disappointed. Excellent accommodation with everything that you could possibly need. We found the accommodation was exceptionally well presented with everything and more than usual provided. A very comfortable home that was a pleasure to return to each evening after a day out sight seeing. Thank you to Tracey for the trouble she goes. I would recommend this home to anyone wanting to stay in the Derbyshire area. This is our second stay at this lovely bungalow. We were met by the friendly owners who had provided a chilled bottle of wine, a box of chocolates and a beautiful spring bunch of flowers (they had also given us some Easter Eggs which was a lovely thought). The bungalow is stocked with everything you would need for a holiday. The homely touches are everywhere from the soap and toilet rolls to the large selection of teas and coffees. There is no need to bring bedding or towels. Each room is decorated to a high standard and it is spotlessly clean. The town of Belper is a short drive away with an Aldi and Morrisons and a pretty high street. It also has a vintage cinema which is worth a visit and an excellent fish and chip shop. There are plenty of places to visit in the area. We went to Ashbourne, Bakewell, Matlock and Matlock Bath, Sheffield on the train and the McArthur Glenn shopping centre. To finish I would recommend a stay at this accommodation. Very comfortable accommodation close to the little town of Belper with every thing needed for a visit to Derbyshire. Stayed here recently with my husband, in all honesty I can’t find anything negative to say. It’s bright and light, very well equipped, spotlessly clean (in fact it is the cleanest accommodation we have ever stayed in). Small necessities such as kitchen foil, clingfilm, dish washer tabs, washing liquid, hand soap etc were available which makes such a difference. The welcome flowers were beautiful and the chocs tasty. It really is a home from home, with excellent broadband facility which was important to us. An excellent place to spend time in. Tracey has provided a beautiful home from home with everything you could want or need. A wonderful part of the country with lots of places to visit. Would absolutely recommend this property for couples and families. Great self catering accommodation in Belper convenient for the Derbyshire Peak District. A very warm welcome from Tracey who went out of her way to make sure we had everything we could possibly need for our months stay.The bungalow is certainly big enough for two or two couples, with off road parking in a very quiet location.Each room is well equipped, especially the kitchen, so lovely to see Denby pottery and plenty, not just the bare minimum as you usually find in self catering accommodation. The towels are plentiful,and soft and fluffy,and the beds and bedding are all good quality.I would definitely recommend and wouldn’t hesitate in re booking. I recently spent five weeks at No 31 after I was temporarily relocated by my insurance company. Everything was spotlessly clean and exactly as the photographs show. The description is also completely accurate and the reviews say it all. The bungalow is very homely and I was very comfortable during my stay. The king size bed was so comfy that I have bought the same one now I’m back home! We were welcomed by Tracey & Andy who gave a quick overview of the property and handed over the keys. They had left us some lovely welcome gifts, which went down a treat!! The bungalow is very well equipped from the kitchen to the bathroom. The kitchen is stacked with crockery, cutlery, pots & pans as well as all the mod cons of washing machine, fridge freezer, dishwasher, microwave etc. The bathroom has enough towels to be able to use one every hour and still not run out, along with lovely soaps etc. The king size bedroom has the comfiest bed with a big thick warm duvet and plenty of storage space for clothes. We did not use the double room but it was just as well equipped. The lounge was really comfortable with a sofa each and a big flat screen tv. There were leaflets and guides galore so you will never be stuck for a place to go. The house is so warm and welcoming that we felt so much at home. It is ideally located for getting out and about and we went to many of the surrounding towns and villages, sampled lots of gorgeous food and bought many souvenirs. We would not hesitate to recommend this property to friends and family. Our stay at this cottage was lovely. The welcome pack was very generous and we found the cottage to be the most well equipped we have stayed in. For example, the owner provided baby shampoo and bath toys as she knew we had a young son – there were lots of really thoughtful touches. The bungalow is very comfortable and has everything you need, even WIFI. There is lots of information about things to do in the area and we found there was loads to do. For those with kids there is a playground just round the corner too. Thank you Tracey we had a lovely time. Just enjoyed a wonderful 11 night stay in this lovely bungalow situated in a quiet residential area of Belper. The owners met us on arrival, explained everything and left flowers, chocolates and essentials to ensure our holiday got off to the perfect start. The bungalow was spotlessly clean, had a lovely private garden and was well stocked with everything you needed for a self catering break including lots of utensils, towels and information booklets. Belper is a lovely town close to the Dales and other areas such as Matlock, Bakewell and of course Derby. Would highly recommend this rental and would stay again on our next trip to Derbyshire. A very well-equipped home with everything we needed provided. The pretty and private garden was safe for our grandson. On top of a hill, walk able into town for the energetic but there is also an hourly daytime bus from the end of the road. Tracey made us welcome and responded quickly to our queries. Extremely comfortable bed and very quiet area. Extremely comfortable property . The owner clearly puts a lot of effort looking after the bungalow and the guests who stay there . Everything was superb. Just back from our second stay at No 31. Its a delightful home from home. You will find everything you need here from the kitchen that is so well equipped and was a pleasure to cook in to the hair dryer tucked in the dressing table drawer, which so many owners forget to provide. A lovely welcome card, chocolates and freshly cut flowers in the vase greeted us with plenty of tea and coffee on arrival Tracey even provides the milk. A good selection of games, books, guides and maps for the area plus the owners knowledge of the best places to go walking and pointers for the best places to eat. There are lots of nice country walks straight from the door and the view at the back is to die for, Beautiful private garden, i love this garden it’s so peaceful. Immaculately clean, comfy sofa’s and beds with gorgeous linen and plenty of fluffy towels… I could go on and on. Tracey the owner is friendly and will be ready with a warm welcome and thank you for another truly relaxing break. This will not be our last stay, i’m always recommending this place to friends and family. If you are still trying to decide if this is the holiday house for you… IT IS PERFECT therefore, it is! This property is very comfortable and a well equipped little jewel, Belper is a good central point to visit Derbyshire dales and the Peak district. The property is in a very quiet location close to town center with a lovely enclosed rear garden. This was a well positioned, quiet, excellently equipped, clean and tidy bungalow and was just perfect for us. The owners greeted us warmly and nothing was too much trouble. We enjoyed our stay and will definitely return.